I love records and record attempts. But should a chance at a WR trump rules at worlds? That’s a question being raised after Charles Allie dropped down from M70 to M65 at Malaga, causing a domino effect of anger and disappointment that reached into the M80 age group. On Friday, M70 sprinter Roger Pierce contacted me via Facebook to describe what he considered a debacle involving the 4×100 relays. Later I spoke with him on the phone, as well as Charlie. I also wrote George Haywood, another M65 relay member and teammate of Charlie’s. Roger and Charlie, both members of the USATF Masters Hall of Fame, were open with me. Charlie said he was given the option of running with his age group or dropping down to M65 to have a shot at the listed world record of 51.12 (at 2011 Sacramento worlds) or a pending mark of 50.63 (at 2018 Spokane nationals). On the phone, Roger told me he felt betrayed and treated with disrespect. Roger says Charlie would have given the M70s a medal chance. Without Charlie, not so much. But the M65 relay pool — even without Charlie — had six or seven possible legs, including Michael Kish, the M65 silver medalist at 100 and bronze medalist at 200. Michael didn’t run on the M65 4×100, however. The team of David Ortman, Thad Wilson, George Haywood and Charlie won with 51.15 — just off the listed WR. No Michael, who hadn’t been invited to run despite an earlier show of interest. On the phone, Charlie said George didn’t approach him until the day before the relays started. “I had already put in the paperwork for the 70 team,” he told me. “I didn’t know who was going to be our replacements” for better-known Kenton Brown (injured) and Ty Brown (absent from Malaga). Charlie didn’t know Michael Kish was available. Roger says Michael was on a trip with his wife to Barcelona but would have been ready for the relay had he been given the heads up after winning two medals. But nothing in the rules allows for an athlete to be given a vote on moving down. The M70 team had four eligible runners with Charlie, and the M65 team didn’t require him. Charles Allie and I have been friends and Houston Elite teammates for close to 15 years now. We have run together on a great number of relays at regional, national and world championships. In addition to the numerous titles we have won together in those meets, we have set five world records in the 4×400 (including lowerings) and one in the 4×200, resulting in our current holding of three WRs and one AR in the 4×400 in relays where we ran together. So in addition to the bond of friendship between us, there is a level of trust and confidence that has been established over the years between Charles and me that we will perform together at our best under pressure. So when I asked Charles to run with us in M65 there was a lot of history that informed his thinking about what to decide. In addition, I told him that obviously whichever team he chose to run with would have an enhanced chance of placing well, but that if he ran with M65 we would have a realistic chance of setting world or American records and winning gold medals. This turned out to be the case, as we broke the AR in the 4×400 by almost four seconds and missed the AR in the 4×100 by just three hundredths of a second, narrowly beating the favored British team and getting gold for team USA, which we obviously would not have done without Charles. In Malaga the M70 USA 4×4 team (without Charlie) ran 5:30.91 for sixth. Third place was 5:01.10. Swapping Charlie back into the M70 relay would have meant that Charlie’s time would have to have been over 30 SECONDS faster than the M70’s slowest guy for even a third place medal. The M70 4×1 had a team entered but DNS. Third place was 58.94 or 14.73 per leg. Charlie was the ONLY USA M70 athlete to run in the 100m prelims, semis or finals (Kenton Brown was a DNF). Seems unlikely that the M70 4×100 even with Charles would have medaled, certainly not gold. Roger is a friend for whom I have enormous respect as a person and as a terrific runner for decades. I can understand why he was disappointed – anyone would be if they were hoping to run with the greatest M70 in history and then saw that change. But it is clear that Phil and Charles made the right decision, the best one for Team USA. First off, I want to say that there are rules for selecting relay members in a handout from the USA track and field rules for relays from the IAAF for WMA championships. Charles Allie and I have also been friends for more than 23 years, and have competed together on a great number of relays at national and world championship levels. There was also a level of trust and confidence between Charles and myself for those 23 years. (Or so I thought!) And I believe we both performed well — also under pressure. We have set world records and U.S. records in both venues a number of times. It appears that George felt that it was OK to take Charles away from the 70-year-old group for both relays, and leave us hanging in the wind, in order for him and Charles to set records. Despite the fact that rule number two and rule number three clearly state that this goes against USATF Masters Protocol. Yes, there was a chance that the 65s could set a world or U.S. record in both relay races. So does that mean you can ignore all the rules on choosing a relay team, without regard to any consequences for the rest of the U.S. relay teams involved? Let’s not forget the fact that they were six legitimate 65-year-olds eligible to run in these relays, without Charles Allie. And that does not include Michael Kish from New Jersey who placed second in the men’s 65 100 and third in the men’s 65 200. Michael was discouraged from even showing up to run in a relay when he requested from Phil last July and during the meet whether he could be guaranteed a spot. Phil told him we can’t guarantee a spot, which is understandable, but how hard would it have been to tell him that if he placed first, second or third in the 100 or 200 he would be guaranteed a spot. Apparently it never occurred to Phil to actually try to get a really good team but relied on people who came to him with their own teams. What lessons can we learn from this if you want to run on a USA team and you’d like to drop down? All you have to do is go tell Phil that you can set U.S. and world records and you’re all set. Apparently the collateral damage and consequences aren’t really a concern, and you can justify it later by saying whatever you want to say, because you ignore the rules anyway. I would like to address George’s comments about what we would’ve run had we had Charles on our team. He points out that our 4×4 team, without Charlie (and he forgot to mention that this was a team the Selection Committee put together after we complained about their decision to wipe out our entire 70s team and the violation of relay protocol and rules pointed out by my wife Diane in an email to them which they refused to even answer). Well, technically they didn’t answer. What they did do was put Sal Talib and myself together with 75- and 80-year-olds who couldn’t even make their own teams, together with us on a 4×100 and a 4×400, guaranteeing we didn’t have a shot in hell at any relay [medal]. And I would like to address George’s comment about our thrown together 4×400 relay team that did run, and finished with a time of 5:30.91. It was anything but what we could put together with Charles, Sal, myself and possibly Howard Booth. We could possibly have run a 4:45 and would’ve been close to Japan who won gold in 4:45.85. Second place was 4:57! We could have had gold or silver in the 70s 4×400 relay if we had been allowed to compete. Keep in mind that Sal was completely destroyed and hardly in the right frame of mind to run in that relay with the team we had been given. Let me also address his comments about the M70 4×100 relay. If a 4×100 team had been formed with Charles, myself, Sal, and Howard Booth, I believe it was possible for us to run a 58.5. Japan won with 55.22. Spain was second in 58.77, Germany’s third 58.95. If we ran well, and I believe we could’ve, we would’ve been right in the mix for either second or third place. I don’t think George understands why I was disappointed. This is so much more than bumping people off teams so that people can possibly set a record because they have trained together and run together for so long in different age groups. What George and Charlie did was take away our opportunity to compete with a decent team, and possibly medal in a world championship. For all of us 65 and over, every time we step on the track could be the last time we ever run; it’s a fragile existence and we try to hold it together for championships. We pay all our own expenses to travel to these meets, and for many of us [this] is a great financial sacrifice and an opportunity to show folks what we can do. The selection committee, George and Charles took that opportunity away from us, and we will never know what would’ve happened because they were so sure that we weren’t good enough to run. Shame on them. It also should be mentioned that when Phil and the committee decided to drop Bob Lida and Mack Stewart down to the 75-year-olds who only had two people, only one of whom was a runner, they completely wiped out any opportunity for the 80-year-olds to even compete in a 4×100 and they were left hanging in the wind. And those guys may never get another opportunity to run in a world championship and we will never know what they could’ve done with Lida and Stewart on their team. Double Shame on the Selection Committee. One final note: We should remember when we are selecting relay teams that it is more than just numbers and what someone has run in a recent meet. Some people have a great deal of courage and tenacity, and the ability to do much more than a single sheet of paper can tell you. These things have to be factored in all the choices, and rather than have a couple of people lobbying for themselves to be in a relay, it would’ve been nice if there was some transparency in the process, that athletes were actually requested to come in and talk with Phil rather than chase him down usually with no possibility of getting a straight answer. Many of us actually know what’s going on when it comes to relays, and know who is the best and who would do the best for us as a team, and we want to run within our age groups. That is why we have five-year age groups, folks! Phil never reached out to anybody, and was never proactive or actually speaking with anyone that I know of about who should be on what team if there was any question he just used “the committee,” brushed off and questions or suggestions (except from George and Charles) and relied on his sheets of numbers. Why do we have to go through this type of mismanagement regarding the relays for some of the teams in every single world championship that Phil is involved in? Time to step down, Phil. I would love to hear from USATF Masters folks who have had similar experiences with Phil and the Selection Committee over the years. Let’s let it all hang out and have some transparency for a change. After all, it is our USATF Masters program, not theirs. Let’s fight back!!! In 2009, at Lahti worlds, I was lucky that exactly four sprinters were in the eligible relay pool for the M55 4×100. My teammates chose me to anchor, and our bronze was a highlight of my track career. But had a faster M60 (and there were many) dropped down to take my place, I would have been devastated. So I’m biased toward Roger. Thus I’m doubtful the protocols were followed. But what do YOU think? 15 Comments on "Special Report: Were rules broken for sake of Yanks’ record shot in Malaga 4×100?" – USATF MTF & WMA representatives do not receive any salary and it often or always costs the volunteer to do their duties – they are paying for the privilege of working their butts off!!! – WMA Marketing and Communications chair is the WMA President per WMA Bylaws meaning Margit Jungmann is the current chair, not Stan Perkins. – USATF MTF relay selection committee worked together for over 8 hours researching athletes, evaluating performances, etc. in addition to the time they spent working on this separately. BTW, they did this on an off day after several WMA meetings when most others were sightseeing and enjoying a bit of time off. – Phil (and many others in similar positions) were working on behalf of their nations’ athletes almost every waking hour (reminder: while paying for the privilege). I ended almost every day in Malaga (after dark) doing work in the main stadium near the team managers’ room where, invariably, Phil would be working on USA team issues. – Phil, without complaint, would be dealing with relatively trivial issues sometimes trying to correct issues caused by athletes not following directions. I could provide many more details of how most of our representatives are working very hard without personal gain but I trust you get the point. I hope the vast majority of athletes recognize we are lucky to have so many dedicated people who are willing to give up much so we can compete. Please thank officials, volunteers and all of the WMA, et all, representatives. Our sport would not exist without you. Thank you so much for all you do. I suggest a more organized and transparent approach. For example, an on line form, with performances in the championship meet, verified performances in present season, posted as a blog and viewable by all. This would make the choices easier and more clear. If an athlete runs faster times than a person in a lower age group, allow the athlete to go down and join a lower age group. John, you had to really be there to see how frustrating it was. I had a similar thing happen to me in Brazil. After winning bronze in the 4×400, I had to fight with several others just to get a spot on the team because slower runners were trying to get their fellow teammates in. This is why they have rules. In Spain, at no time on the day of the relay practice were all of the members of the committee there together. When we did talk to one, they basically referred us to the other person. I wrote them an email but never received a response. In addition, Phil has no idea who any of the athletes are including Charles Allie and Antwon Dussett. He basically asked us who they are and how to spell their names. At every world championship, this kind of stuff happens even though there are clear rules. Some people lie about their times and get away doing it. It’s not fair for the athletes. We need a more transparent system so that new athletes aren’t discouraged from applying. Michael Kish finished 2nd in the worlds but was told that he couldn’t travel with his wife and come back to run the relays. USATF team managers have their expenses paid by USATF – they do not receive a salary but they are compensated for flights, hotel room and meal expenses. This is pretty minimal compensation for the very long hours they put in during the long meet. But this does not put them above criticism for what appears to some to be efforts to win relay medals for Team USA as the priority over age group relay medals. As for the criticism about the manner of selection for the relay teams – things are better than they were a few years ago when fist fights broke out over who would and would not be on relay teams but clearly more clarity is needed over the rules that are to be followed. The rules for selection should be made public and clear – this is the case (in my opinion) for team selection for non-stadia teams. If there is a “natural team” in an age group- that cannot be broken up in order to move one or more athletes down into another age group to make up a team. For example – if there are 3 age group competitors in the W 65 age group – that is a team for that age group. The Team Manager is not allowed to move one or more of those competitors down into a lower age group to make up a team for that lower age group. If this rule was applied to the track relay teams – then there would have been a M 70 4 x100 relay team and a M 80 4 x 100 relay team – for example – as moving an athlete from a natural team down to make up a stronger lower age group team would not be allowed. I have a problem with what seems to be the desire to win relay team medals by moving down the faster sprinters to a lower age group and leaving others in the older age group hanging without a team or a team made up of athletes who are not track athletes but compete in other disciplines. In my view this does a great disservice to the much older age group runners who may never have another chance to run a 4 x 100 or 4 x 400 relay in the WMA meet again. The runners in the M 80 age group were done a great disservice by moving a couple of them down to a lower age group in the hope of “getting medals” for the medal count. How many of these men will still be running by the time of WMA Toronto 2020? Such a decision should not be made without the express agreement of the M 80 athletes who were available and willing to run on a relay in Malaga. I am sometimes on an age group relay at WMA meets although I am not a sprinter but I am there, and I usually run the 800, 1500, and 5k and x-c. If a 4th is needed I am willing and happy to run to make up a team although my only claim to fame in a relay is that I have never dropped the stick. In 2020 in Toronto it is possible that there will be 4 W 85 USA women for a 4 x 100 and 4 x 400 relay. That will be pretty amazing and world records will be there to be had. If the team manager decided to drop down one or more of the W 85 to make up a W 80 or W 75 team – that would be beyond an insult to the W 85 USA runners. That should not be allowed just as it was a travesty to drop down potential relay members of the M80 runners to fill out teams in lower age groups. This meet is NOT about how many medals Team USA can harvest at the expense of age group medals – this meet is about the individual athletes of any age group competing in their age groups and winning medals IN THAT AGE GROUP. Sorry Phil, Rex, and who ever else was making up the relay teams – it is NOT ABOUT YOU, it is about the USA athletes and their wishes. They do the training, they pay their way to the meets, it is about them. Clarify the rules for the 4 x 100 and 4 x 400 relays before the next WMA meet. It should be about the individual athletes and not about world wide bragging rights about medal counts at WMA meets. Just because you have 4 people in that age group doesn’t mean that they are the most competitive or medal contender for that age group. This is why some people are asked to drop down. Yes I know that people pay their own money to attend and compete in Worlds but at the World stage why wouldn’t you put the best on the track. On the Olympic stage the 400 is deep and there’s a pool to choose from, but it’s about the best 4, not just any 4. Everyone has a different goal as it relates to their World Masters experience. However when it comes to relays we cannot apply local meet rules to the World stage. Point blank! It is about winning. It’s about medal count. It’s about being competitive and there’s nothing wrong with that. This was my first world level meet and was clueless about the selection process. I was eager to participate in the relays, and with only 4 of us registering in the M80 4×100 assumed it would be a team. I would have been the slowest on the team but would have found it fun medal or no. I haven’t run a 4×100 since high school (then 100 yds) so I was clearly unqualified. Still, being unqualified didn’t stop me from being on a world record setting 4×800 team at the National Indoor this year. Even though I was unsure if I could even run that far without a walking break. It is hard to get 4 M80s together on the last day of a meet, seems that when such a team is available, it should be run. After reading all the “reasons”, still don’t understand the decision. I will be sure though, in the future, to bring a “sprint resume” to attach to the form, that way it will be clear, if disqualified, what qualifications were lacking. I was on the 75 year old Gold Medal winning relay team with Bob Lida in Brazil. For five years I kept in touch with the members of that team and others who could possibly form an 80 year old relay team in Malaga. Due to injuries and other reasons, by the time we got to Malaga we had four 80 year olds for a 4 x 100 relay team signed up and ready to run. After a 5 year odyssey of cobbling together an 80 year old team, Phil Greenwald eliminated the team. His reasons: “the 80 year old team did not have an alternate.” So he dropped down the two best 80 year old sprinters to form a team with a 75 year old high jumper and pole vaulter who didn’t have a team at all. (There were 14 eligible 75 year olds too choose from, but Phil decided they needed two of our four 80 year olds for a 75’s team) When I complained about my 80’s team being eliminated, Phil Greenwald and Rex Harvey wrote that “I had no relevant running experience in Malaga,” (I ran five races) The two 75 year olds he chose to break up our team for; a Pole vaulter and high jumper didn’t run any races at all prior to Phil eliminating our team on their behalf. After Phil made this unfortunate decision, Rex Harvey sent me an insulting missive stating that I had “no relevant races.” Adding that I should run the 400M. (I ran on the 4 x 400 Gold Medal winning team in Porto Allegre, Brazil. Five weeks prior to Malaga, I ran the 400M, (Silver) the 4 x 400 Relay and the 4 x 100 relay at the US Nationals in Spokane. I also won gold in the 1500M, 5K and 4 x 800M relay in Spokane. To his credit, Phil sent me the committee’s long, involved process, which he said included 250 sheets of paper of how the teams were put together, citing that their decision was a close call as to whether or not to eliminate the 80’s team. If the decision was a close call, an easy tiebreaker would have been to follow Rule #2 instead of breaking it to eliminate our team. The committee’s rambling and subjective process could be simplified by doing what every running team has done in the 25 years since I’ve been running: Put the fastest 4 runners in each age division on their age division team, and if there are any slower alternates drop them down, if needed, to fill out a younger team. After combing through the Committee’s process a number of times, the only thread I can find is that their mission is to drop down outstanding runners to lower age divisions whenever possible in order to make it more difficult for them to win. Getting four 80 year olds to the line for a relay is unlikely and every 80 year old team has their strong and weak points. Our team stood a much better chance of winning gold against 80 year olds than the 75 year old team had by dropping down our 80 year olds to run with a high jumper and pole vaulter. The Mission Statement of the USATF is unclear although they claim “inclusiveness” on the website. One would generally think inclusiveness and winning medals would be the main focus in the World Games. If inclusiveness is one of their missions they failed miserably ending up with two teams instead of four. If winning medals was a mission they failed even more miserably as the two teams they eliminated were odds on favorites to win gold. I want to apologize to Roger Pierce and the other M70s, M75s, and M80s who were negatively affected by my offering my opinion on what was would be an optimal relay lineup and yield the best results for Team USA to set records and win gold medals. What I expressed to my teammate Charles was merely my point of view and not a decision, as I am not part of the selection committee. I would never have wanted the proper process for team selection to be disregarded. I was unaware of any of the details that Roger laid out in what he wrote, and hearing them now I can certainly understand how he feels. For example, I was unaware until now that Michael Kish may have been available to run M65 4×100 in Malaga. Since his time in his 100 meter final was three tenths of a second faster than Charles’s time, I clearly would have felt that the best lineup was for Kish to run M65 and Charles to go M70 if I had known Michael was available. I know very well how much work and sacrifice it takes to compete at a high level in the world championships. I have looked up to many of those guys, especially Roger and Bob Lida, one of the all-time greats in our sport, ever since I started in masters track fifteen years ago. I deeply regret that those guys ended up being deprived of the chance to compete with the lineup that they wanted. To have people whom I so deeply respect feel deprived that way saddens me greatly. I agree with Roger that more transparency is needed. If I had been aware of all the facts and considerations that I now know about, I would have had a very different opinion as to what was the best lineup for Team USA. I think that all of us athletes should push for greater transparency and better processes for relay team selection. Thank you Bob Lida for your comments.. You are one of the classiest Masters sprinters of all time.This situation is just the tip of the Iceberg….Their lack of transparency literally “screams” at anyone reading about it.. And when anyone says, “That’s all I want to say about it,” You can be sure that means…”You found out what we are doing…and we are not going to bury ourselves any deeper in this hole!! !” Too late… Pandora’s Box is wide open….we want answers…This has to stop happening at every World Championships. And thank you Mary, Elmo and William for sharing your thoughts and experiences.. There are many more who are afraid to speak out . If you are reading this and have an opinion or something to add…..DO IT…. Count me in with the USA relay tracksters who are tickled pink to have the very great honor of running while wearing the red, white and blue uniforms of our country. Phil, whatever relay teams you select, I’m happy to be a part of, or, if not selected, I’ll be on the sidelines cheering my loudest and proudest. I am wondering if Howard Booth and Curtis Morgan have any idea of how they ended up with a relay team that included 2 (fast) 80-year-old runners? 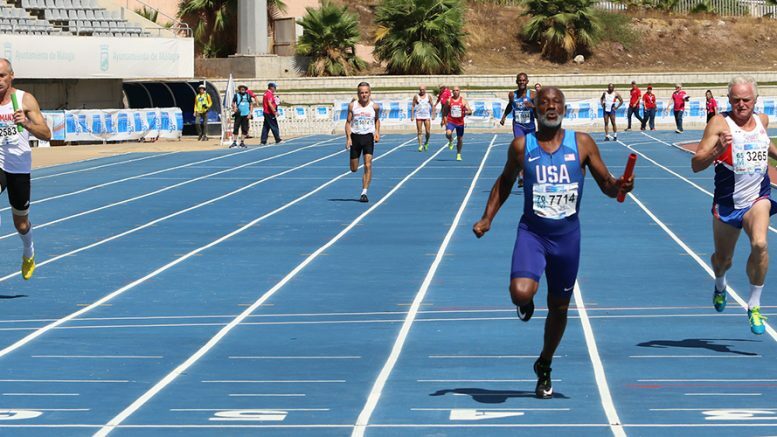 The IAAF WMA RULES FOR RELAYS clearly state: Rule #2 – Athletes from an older age group who ARE NOT NEEDED as runners or alternates may compete for a younger team. But these 2 80-year-olds WERE needed for the team. It would clarify things if either Curtis or Howard understand how this happened, and can shed some light. The 80-year-old team who lost their teammates to the Curtis/Howard team were and still feel blindsided. Are we missing something? Curtis says he is “tickled pink” about being selected for the team. You can’t imagine how differently the guys feel who lost their rightful place on the team and were deprived of that chance. At 82-ish they may never have another chance. Just very curious to know if Curtis and Howard know how that happened, since it went against the rules. Just like any other World Championships relay, it should be about maximizing talent and winning; what is the best team possible to ensure the USA wins. Each year I feel that the selection process gets better. Just because you are in an age group or just because you participated in the Masters World does not mean you are guaranteed a spot. To create the best possible team, for a medal or WR, the selection committee must be able to see who are the best 4 fastest athlete to represent the age group. Other countries use a strategy and we should do the same. Not everyone is going to agree. Not everyone is going to be selected. Has anyone suggested just staying in your age groups, no matter what? That might solve some of these issues.